This was confirmed by Freddie Roach who explained that De La Hoya started to deteriorate in the second round after he felt Pacquiao's power while being bombarded with body shots in the opening round. "The body punches killed De La Hoya," quipped the 48-year-old Roach. "I knew it because he started to slow down in the third and fourth after he felt Manny's power." Roach said the whole plan to tire out the taller De La Hoya worked effectively as early in the fourth round when De La Hoya could no longer avoid Pacquiao's dizzying body shots. In the fourth round, the good-looking 10-time world champion had an ugly gash in the lower left eye courtesy of the Filipino buzzsaw's powerful jabs that flickered like howitzers. The slower De La Hoya, 35, did not answer the bell in the ninth round thus the bout, touted as the biggest fight transaction in 2008, went down as an eight round technical knockout (TKO) defeat for the man known as Golden Boy who once conquered Hollywood with his good looks aside from winning the United States' lone gold medal in boxing in the 1992 Barcelona Olympics. Nacho Beristain, De La Hoya's Mexican trainer, admitted he had to halt the fight "because that was the right thing to do, De La hoya being a prominent personality in boxing." He did not go down from Pacquiao's avalanche of body punches but De La Hoya was brought to the hospital "as a precautionary move" although he wasn't hurt, confirmed De La Hoya's childhood friend Eric Gomez who presented a grim face during the post-fight press conference. De La Hoya's second TKO loss in a checkered career impaired his record to 39-6, 30 KOs. He had been busted by middleweight champion Bernard "The Executioner" Hopkins who joined him in the ring and had predicted "De La Hoya will send Pacquiao to school." Pacquiao was comfortably ahead on the scorecards of judges Stanley Christodoulou (79-72), Adalaide Byrd (80-71) and Dave Moretti (80-71) at the time of the stoppage. Referee Tony Weeks admitted he didn't expect the fight to last in the eighth round but said he was prepared to pull the plug if De La Hoya was hurt and wouldn't fall because he was protected by the ropes. 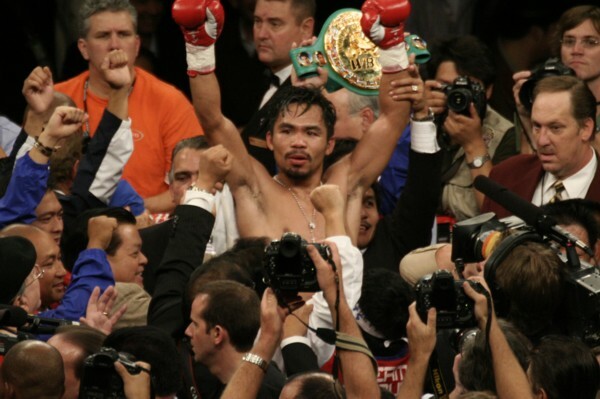 Pacquiao, who improved to 48-3-2, 36 KOs, outpunched De La Hoya, 585 402. 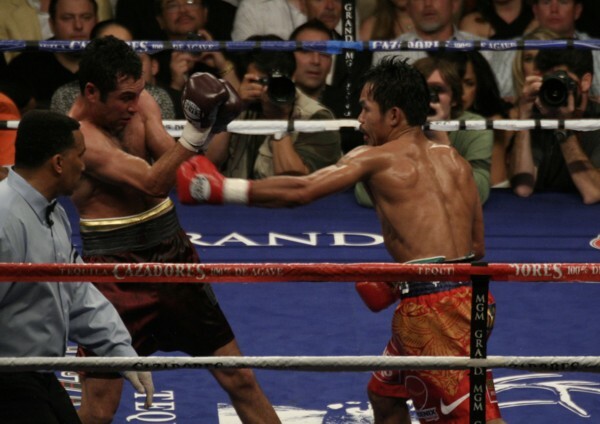 Pacquiao connected 224 as against De La Hoya's 83. De La Hoya, who owns the Golden Boy Promotion that co-promoted the pay-per-view show, did not show up on the post fight press conference. He submitted only 51 power punches against Pacquiao's 195. 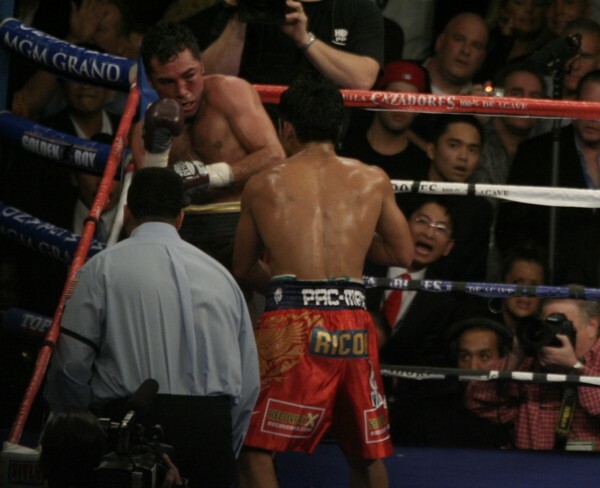 De La Hoya, however, connected 32 of his 238 jabs as against Pacquiao's 29 of the 252 thrown. Top Rank CEO Bob Arum said the press people were right when they reported earlier that the fight would be a mismatch for De La Hoya. "They are right, it was a mismatch," he said. Several Mexican fans cried when De La Hoya's hand was raised by Weeks. Filipino fans who were outnumbered by De La Hoya's supporters inside the arena, bursted in jubilation when it was confirmed their idol, the underdog, had scored a big upset. "De La Hoya is my idol. He is still my idol. It so happened that there are lots of Mexicans in my division. I am not really a Mexican killer. I love the Mexicans," declared Pacquiao who was unmarked and could have fought De La Hoya for 20 rounds. The post fight press conference extended for two hours after more than 500 journalists, who came from different countries, obliged the ring superstar for autographs and photo-ops.